Congratulations, Sue! Look for an email from me asking for your mailing address. And I'm so excited because I have a new giveaway this week and it's also SIGNED BY THE AUTHOR! Synopsis (from Indiebound): The next person who compares Chloe Cho with famous violinist Abigail Yang is going to HEAR it. Chloe has just about had it with people not knowing the difference between someone who's Chinese, Japanese, or Korean. She's had it with people thinking that everything she does well -- getting good grades, winning first chair in the orchestra, et CETera -- are because she's ASIAN. Why I recommend it: I've been one of Mike's loyal followers since, well, practically forever (in social media terms). I've always found his blog posts and tweets thoughtful and thought-provoking. He's a founding member of We Need Diverse Books (and yes, people, we STILL need diverse books!). 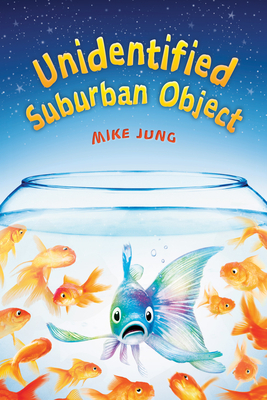 But all of that is really besides the point because I LOVE THIS BOOK and I would love it even if I didn't know anything about the author and even if I hadn't read GEEKS, GIRLS, AND SECRET IDENTITIES, Mike's first MG novel, published in 2012. Chloe's voice is pitch-perfect. You will feel you are listening to an actual twelve-year-old girl gripe about her parents and school. Her family history is wild and crazy, but makes for a fun, fast-paced read. Chloe's friendship with Shelly reminds me of actual friendships I had in junior high. And it's always refreshing to read a story in which the main character has two loving parents. Plus, this is a lighthearted, humorous novel that nevertheless delves into deeper issues of prejudice and racism. Today's kids need this book more than ever. Favorite lines (from page 66): "The notes spilled out of the violin strings like beams of sunlight, and I got that tingly feeling I always get when I'm playing something as well as I can play, except I was just playing a scale!" Giveaway details: I have a SIGNED hardcover copy to give away. To enter, you must be a follower of this blog and you must comment on this post. US mailing addresses only, please (so sorry!). If you mention this giveaway on social media, please let me know and I'll give you extra chances. This giveaway ends at 10:00 pm EDT on Sun June 5 and the lucky winner will be announced on Monday June 6, 2016. Good luck! Synopsis (from Indiebound): Growing up in the shadows cast by two world wars, Annabelle has lived a mostly quiet, steady life in her small Pennsylvania town. Until the day new student Betty Glengarry walks into her class. Betty quickly reveals herself to be cruel and manipulative, and while her bullying seems isolated at first, things quickly escalate, and reclusive World War I veteran Toby becomes a target of her attacks. While others have always seen Toby's strangeness, Annabelle knows only kindness. She will soon need to find the courage to stand as a lone voice of justice as tensions mount. 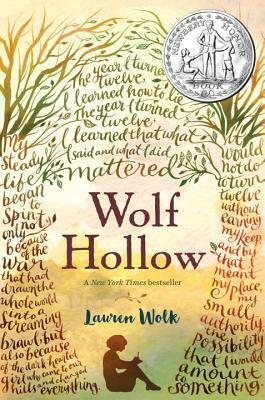 Brilliantly crafted, "Wolf Hollow" is a haunting tale of America at a crossroads and a time when one girl's resilience and strength help to illuminate the darkest corners of our history. Why I recommend it: This book blew me away. I'm impressed by the imagery and the voice, and astonished by the depth here. Any adult who dismisses the importance of children's literature should read this novel. A haunting story that will stay with me for a long time. 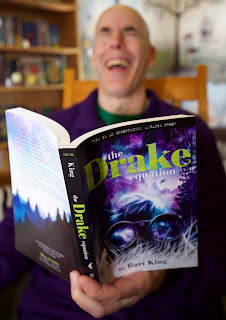 THE DRAKE EQUATION and a guest post from author Bart King -- PLUS a giveaway! The Drake Equation by Bart King (May 10, 2016, Disney Hyperion, 320 pages, for ages 8 to 12). 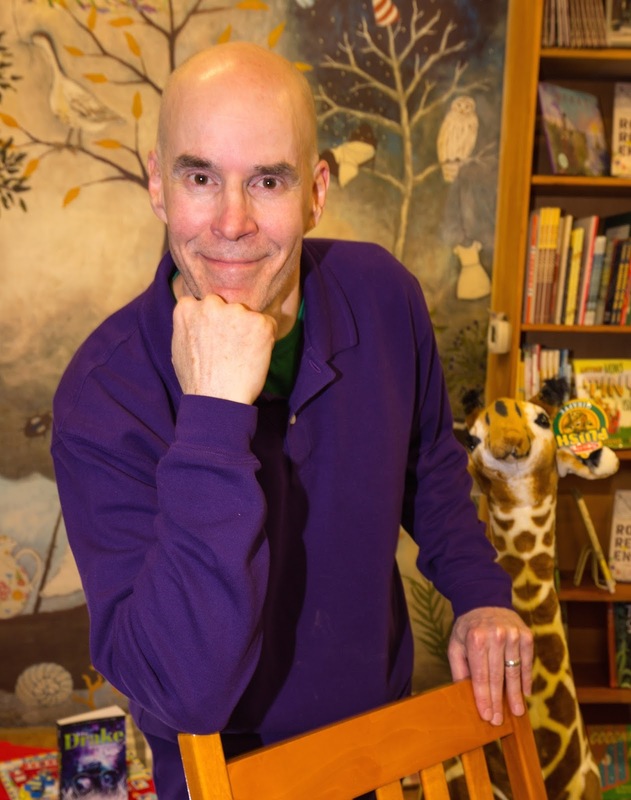 Synopsis (from Indiebound): Noah Grow is a bird-watcher. If you're picturing some kid in a big floppy hat, peering up into trees through giant binoculars . . . well, good job. That's exactly what he does. Right now, Noah is on a quest to find a wood duck. According to his calculations, aka the Drake Equation, the odds are good--really good--for spotting one. That's why he gets off the bus at the wrong stop. And that's how he ends up running down a hill, crashing into a fence, and landing right next to a strange, glittery object. Why I recommend it: I recently spent a fun weekend with this book and was a little sorry to see the story end. Rich in humor (I haven't read such a memorable bathroom scene since The Fourth Stall) and filled with organic imagery ("My stomach dropped like a diving osprey"), this is an entertaining and imaginative tale that's perfect for the 8 to 12 age range. With its timely and subtle environmental theme, this book reminded me of Carl Hiaasen's MG novels. Kid readers will love the wild and crazy adventures that ensue after Noah figures out how to access the power of the disc, and of course they'll hoot over the bathroom humor. Teachers will appreciate the curriculum tie-ins to English vocabulary and science, used in such an ingenious way, kids won't realize they're learning! I'm honored that author Bart King agreed to write a guest post. Take it away, Bart! Hi! Bart King here. In the unlikely event you’ve heard of me, it’s probably because of my funny non-fiction books for younger readers, like The Big Book of Superheroes. Two years ago, I undertook a new writing project. It was one that tested my resolve, cursed me with sleepless nights, and basically made me want my mommy. Because what I was trying to do was write a novel. And guess what? Writing that novel really WAS incredibly hard. But after 13 drafts, I *think* it came out the way I intended. And now it’s on to the next project. So if you’ll excuse me, I need to practice my keyboard flourishes! Bart, I'd say you more than accomplished your goal. 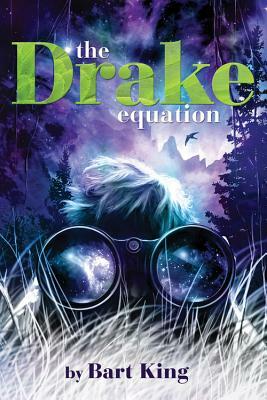 I'm so impressed that The Drake Equation is your first novel. Writing all those humorous non-fiction books really prepared you for this. Giveaway details: The publisher has generously offered a hardcover copy for giveaway. To enter, you must be a follower of this blog and you must comment on this post. This giveaway is open to US mailing addresses only and will end at 10:00 pm EDT on Sun May 29. Winner will be announced on Monday May 30. So you have three weeks to enter! Synopsis (from the publisher): When eleven-year-old Thyme Owens’ little brother, Val, is accepted into a new cancer drug trial, it’s just the second chance that he needs. But it also means the Owens family has to move to New York, thousands of miles away from Thyme’s best friend and everything she knows and loves. Thyme loves her brother, and knows the trial could save his life—she’d give anything for him to be well—but she still wants to go home, although the guilt of not wanting to stay is agonizing. She finds herself even more mixed up when her heart feels the tug of new friends, a first crush, and even a crotchety neighbor and his sweet whistling bird. All Thyme can do is count the minutes, the hours, and days, and hope time can bring both a miracle for Val and a way back home. Why I recommend it: This is one of the clearest, strongest middle-grade voices I've read in years. You'll find yourself believing Thyme is a real 11-year-old girl telling you her story. Also, I've lived in Manhattan (in a third-floor walk-up) and the details about the city are spot-on. A sad but sweet and even humorous novel with a lot of heart and a lot of hope. 1) Tell us a little about neuroblastoma and especially why you decided to have a character with this form of cancer. Neuroblastoma is a cancer that is primarily found in developing nervous tissue. It can manifest in many different areas, and children ages five and younger are most commonly affected. I first became acquainted with neuroblastoma in 2007, when a child in my Brooklyn neighborhood was diagnosed with the disease. I followed his family’s story closely through their blog, and ended up joining another local mom’s effort to raise funds for pediatric cancer research through baking and selling cookies—which became Cookies for Kids’ Cancer. Several years later, when I started writing, the stories of these families fighting cancer in such young children still resonated with me, in part because the treatments for the disease are very difficult to endure. When I decided to write a character who had a younger sibling facing an illness, neuroblastoma was the illness I wanted to portray. 2) My kids were on the Lighting and Sound crew in their school theater department, so I loved your scenes about figuring out how to make the sounds for The Wizard of Oz. Were you involved in theater yourself? If not, what kind of research did you so? I’m glad you enjoyed those scenes! I was involved in theater on the periphery in both high school and college. While I never had the urge to perform, I really enjoyed working on the sets and painting backdrops, and once you’re back stage you end up exposed to the whole world of theater! Also, a friend of mine is a sound producer and foley artist, and I’d been acquainted with his work over the years, so between those two influences I had a feel for the scenes I wanted to create for Thyme’s school play. I researched children’s theater productions and watched quite a few performances on YouTube to fill in the gaps, and had a lot of fun inventing sounds, which in many ways related to my work as a product designer. Having worked with all kinds of materials to produce household goods, I have a feel for their various properties, which helped me mock up my ideas for different sounds to test out in our kitchen. 3) What are some of your favorite MG titles? And what's your favorite snack while reading them? Ooh, snacks! I am a snacker. I prefer salty over sweet…so most often you’ll find me with a bag of bagel chips or some slices of cheese with olives. I don’t eat much while I read, though, because I love books in print and I’m still horrified at the idea of leaving a fingerprint on the page! Childhood habits die hard. I love the variety of titles in middle grade, and I love so many of them. One for the Murphys and When You Reach Me are two of my favorites. I also love verse novels, like Brown Girl Dreaming and Blue Birds. I’m reading Mayday right now, and the voice in it is amazing! 4) I love verse novels too. What's next for you? 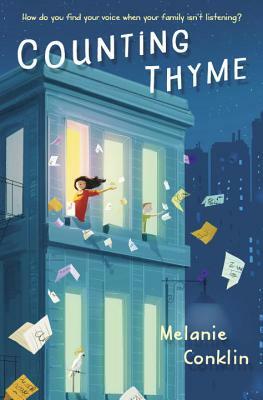 Will there be another novel about Thyme and her family? Or are you working on something new? Can you give us a hint? Next up for me is another middle grade novel! I’m drafting the story right now, so it’s a very exciting time of discovery and surprises. It stars a whole new cast of characters, and I can tell you that it’s about family and friendship, and though it’s a very different world from the one in Counting Thyme, it’s also about finding your place in the world after life throws you a curveball. In many ways, this story is even more personal for me, and I can’t wait to share it one day soon! And I can't wait to read it! Thank you for visiting, Melanie. Readers, have you read COUNTING THYME? What about any other MG novels about a sibling with cancer?